CUPE 917 (UVic outside workers) helped feed the hungry and provide warm winter clothing to Greater Victoria’s vulnerable at the “Labour of Love” event co-hosted by United Way Greater Victoria Labour Committee and the Victoria Labour Council. As well as collecting more than 200 blankets, jackets and clothing, members of the local cooked a five-gallon batch of chili. They helped to serve and clear tables, wash dishes, and hand out jackets at the January 12 event. CUPE 917 members Claude Champagne and Nick Vagvolgyi, a mechanic and carpenter respectively, prepared vegetables and cooked the chili after work the night before the event. They finished their recipe by simmering the winning concoction overnight in a double boiler. Their recipe included “everything,” with the (no longer) secret ingredient of cacao. Representatives from the Victoria Labour Council, Our Place Society, and Together Against Poverty Society served as judges. 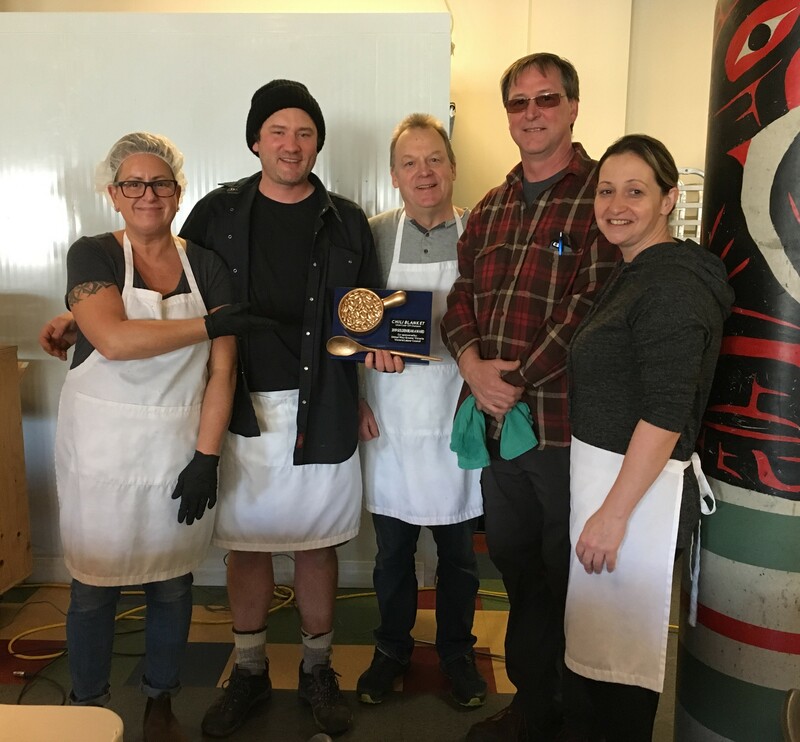 As well as winning the coveted Golden Bean award for the best-tasting chili, members got personal satisfaction through helping their community. The local is already looking forward to returning next year as defending chili champions. The inaugural event was held in January because typically donations drop off after Christmas, when the need for warm clothing becomes more acute. Within an hour of the event’s opening, almost everything had been claimed. The local, which supported the event by contributing $500, was pleased to receive generous support from their employer as well. UVic’s Food Services donated chili ingredients while Resident Services provided used blankets.